Pathway Is Coming Out Soon! Available April 11th, Pathway is a strategy RPG set in the 1930’s. Honestly, it looks and sounds friggin amazing! DYNAMIC ADVENTURES – Discover 5 different campaigns of varying difficulty, with each and every attempt generating a new web of encounters and unique storyline. TOUGH CHOICES – Every explored location presents you with one of over 400 hand-crafted story events. Search the well? Save the villagers? It’s up to you! DECISIVE CONFLICTS – Use cover and positioning in exciting turn-based squad combat. Learn to make the best use of your equipment and your team’s abilities, to vanquish a relentless foe, in ruthless and clever ways! BUILD YOUR TEAM OF ADVENTURERS – Each of Pathway’s 16 unlockable characters has their own skills, weaknesses and quirks, from the almighty melee strength of Brunhilda, to rifle expert daredevil Jackson, and knife-wielding huntress Shani. HIDDEN TREASURES – Unearth riches untold, from common weaponry to rare and unique items with special abilities. Perfect your load-out and cash-in on your high-value treasures for a tidy profit. THRILLING VISUALS – Classic 16-bit pixel art enhanced with unprecedented depth, lighting and shadows using Pixel/Voxel Hybrid Technology. RECOVER & REPLAY – Sometimes failure is the best path to winning. 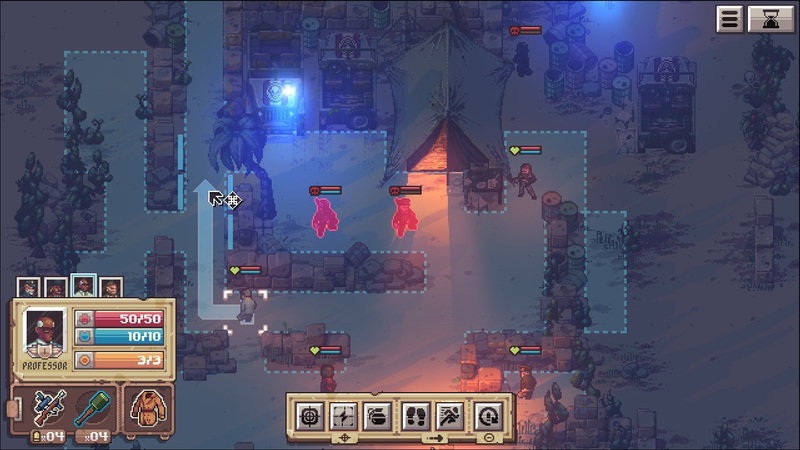 Progressively explore the procedurally generated world, and grow stronger and learn more with each defeat, taking your loot with you even after death. I’m excited. It looks really good. I love that characters can still grow after failing. I love games with solid progression. Pathway comes out April 11th!